Every car on the road has a 60% chance of being in a collision sometime during its lifecycle. However, simply knowing it can happen won’t help prepare you for an accident, or help you remember what you need to do. In the moments after auto accidents occur, you often feel stressed, dazed, or even injured. Figuring out what needs to be done can be tricky at this critical time. Take a few minutes now to plan out what you will do in the event of an accident, so that if it does occur, you’ll be prepared. Here are the eight steps you need to remember after an accident. Get out of harm’s way. If possible, drive to the side of the road. If not, turn your hazard lights on and wait for an officer to respond to the scene. One accident can create more accidents, particularly in heavy traffic, in bad weather, or in the dark. Don’t exit your vehicle in heavy traffic unless it is unsafe or on fire, unless instructed to do so by police officers. Take inventory of your condition and that of any other passengers in your vehicle. Once it is safe to exit your vehicle, check on the condition of the other driver and passengers (if another car was involved). Keep calm and don’t place blame or admit fault at the scene of the accident. Be corporative, but don’t try to figure out who’s at fault. This is a job for the police to work out. Call the police. Inform them of your location and report the incident, even if it is a minor accident and no injuries were involved. Most states require that you report all traffic accidents. Document the scene. Use a phone camera to take photos. Wait for police officer to arrive on the scene unless instructed otherwise. If there are no injuries, you may be told by the police that you can leave the scene if it is safe to drive your vehicle. Call your auto insurance company. You are required by law to carry your auto insurance card at all times because few can remember their insurance carrier’s phone number right after an accident. Call and file your insurance claim as soon as possible. Some states require you to call within 24 hours and others give you a few days. If you go too long, you risk having the insurance company not cover any damage. Your insurance company will determine whether your car (or the other vehicle involved) has been totaled or whether the damage is repairable. 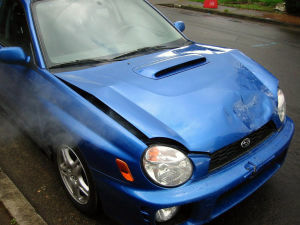 If your car has been totaled in an auto accident, contact Messy Motors. We buy junk cars for cash, so you can get out of your old vehicle and into something that fits your needs.